By Megan Gorman | February 27, 2018. 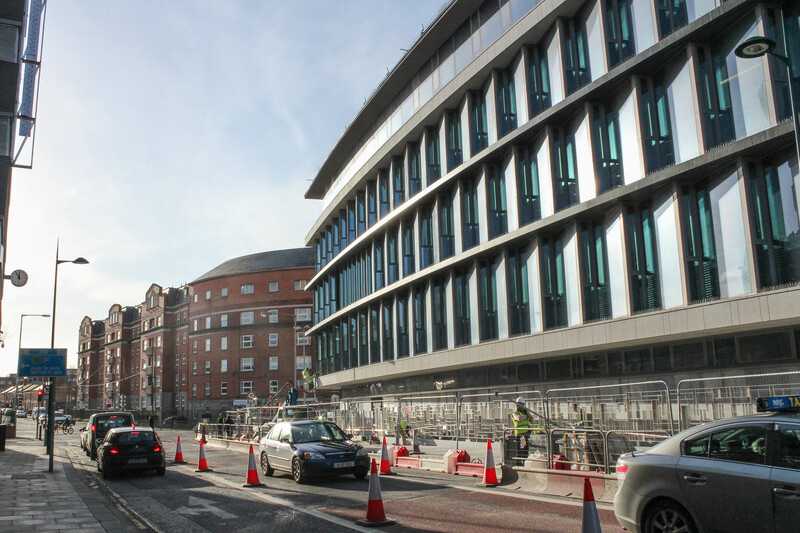 A new Garda building is nearly finished in the historic Kevin Street area of Dublin. The station will consist of a 6,840 square metre divisional HQ, with a 5,400 square metre double basement. 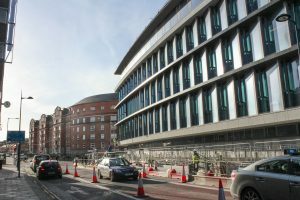 The construction began in February 2015 and it was set to be finished by the start of 2017. Two years later, the building, though far along, is nowhere near finished. The site is still covered with white tarps, and workers are there every day. It is one of three new Garda projects being worked on at the moment. New regional headquarters are also being constructed in Galway, in addition to a divisional HQ for the Wexford area. The new divisional HQ will be located to the east of the old Garda station. The existing Kevin Street station, next door to Marsh’s Library, has been a police station since 1806. The building is over 800 years old. According to the Department of Justice the current Kevin Street Garda Station is one of the busiest stations in the country, so there’s been a growing need for more modern facilities for it.